Affectv engineers are working on a series of products to make advertising more social. The company plans to launch the image-sharing widget Slingpic in January and social banner ads for publishers in February, according to Glen Calvert, the company's CEO. Data comes partly from companies supporting URL shorteners and video-sharing sites. Slingpic will pull in bits and bytes to make images more social, whereas social ads will target through banner ads like-minded friends. Calvert said that similar to Facebook Likes or Google +1s, Affectv will build out a series of tools that identify friends in a social circle who have a similar view about specific advertisements or formats. Media companies will continue to move up the funnel, which Calvert believes will make it easier for brands to invest in online advertising. This should enable brands to better analyze conversations and response rates. Calvert points to U.S.-based Media6Degrees, or Md6, as a rival to the U.K. company. 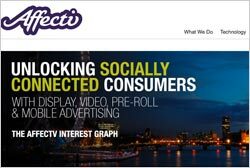 Now nearly a year old, Affectv began providing social targeting, analyzing how users connect and share content. The technology tapped by companies like ESPN looks beyond browsing behavior to infer social signals, such as connections to users and frequency, trending links and sentiment to target content and ads. For example, Affectv can target ads to consumers taking photos at live sporting events who tweet them to followers. That's the idea of a recent ESPN campaign. The action by the consumer taking the photo confirms that he and those he tweets are interested in live sports events. It takes an offline activity and targets ads online via display and pre-roll ads. Social networking ads account for more than one in four U.S. display ad impressions -- 28% in October, according to comScore. Five percent of all ad impressions viewed in the U.S. were "socially enabled," allowing users to click through to Facebook or other social-networking sites. Although more than a quarter of display ads are seen on social networking sites, the category only attracts 15% of U.S. display ad dollars, the data firm estimates.